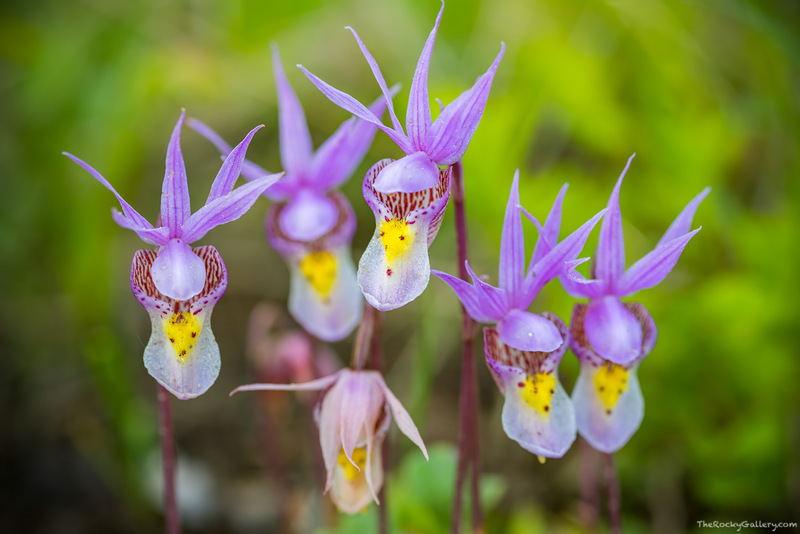 I have many favorites when it comes to Colorado wildflowers but I have to say I'm partial to the Calypso Orichid or Fairy Slipper. These dainty but beautiful wildflowers can be found blooming amongst the forest floor as the winter snows melts in Rocky Mountain National Park, typically in early June. They are tiny and while they can be found blooming in groups oftentimes they grow in single sets or pairs. I highly recommend when you encounter a grouping of Fairy Slippers when out on a hike you get down on your knees and take time to examine these beautiful wildflowers. I found this particular set growing along the East Inlet trail not far from Adams Falls. Most hikers I encountered walked right by this beautiful group of flowers missing out on their delicate beauty. Photo © copyright by Thomas Mangan.